The water swirls around in the small cove along the coastline of Grand Manan Island in the Bay of Fundy in New Brunswick, Canada as the fog starts to lift across the horizon. At Southwest Head on Grand Manan Island, you can look down upon the rocky coastline and watch the water crash against the rock cliffs. View of the coastline from Southwest Head on Grand Manan Island, Grand Manan, Bay of Fundy, The Fundy Isles, Fundy Coastal Drive, Route 776, New Brunswick, Canada. 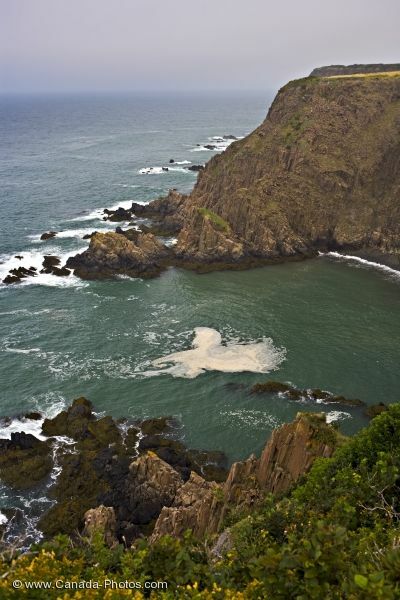 Picture of the rugged coastline of Grand Manan Island in the Bay of Fundy in New Brunswick.